The German Panzerwerfer is one of two different types of half-tracked multiple rocket launchers employed by Nazi Germany during the Second World War. The two self-propelled artillery vehicles are the 15 cm Panzerwerfer 42 auf Selbstfahrlafette Sd.Kfz.4/1 (based on the Opel Maultier, or "mule", half-track) and 15 cm Panzerwerfer 42 auf Schwerer Wehrmachtsschlepper (or Panzerwerfer auf SWS). The Panzerwerfer 42 auf Maultier weighed 7.1 tonnes, was six meters long, two meters wide, and nearly three meters high. It was capable of reaching speeds of up to 40 km/h. One of these half tracked vehicles generally carried a Nebelwerfer 41 launching system, which was specially designed to be mounted on the Opel-engine powered Panzerwerfer. The German engineers designed this system because of the conspicuous trails of smoke left behind by the Nebelwerfer batteries, which necessitated a self-propelled artillery piece. The system contained 10 missile tubes, and generally carried 20 projectiles, enough for the vehicle to fire two full salvos. Though intended to provide fire support and operate well behind the point of contact, some Panzerwerfers also had a machine gun mounted above the cab for protection against infantry attack. Known as the "Moaning Minnie" by Allied soldiers for the distinctive noise the rockets made when fired, it was less accurate than a dedicated artillery piece, but its ability to saturate an area with fire and strike terror into enemy infantry made it valuable. It saw widespread use during the war. This kit comes in a non shrink-wrapped tray and lid box that is held shut with circles of scotch tape. 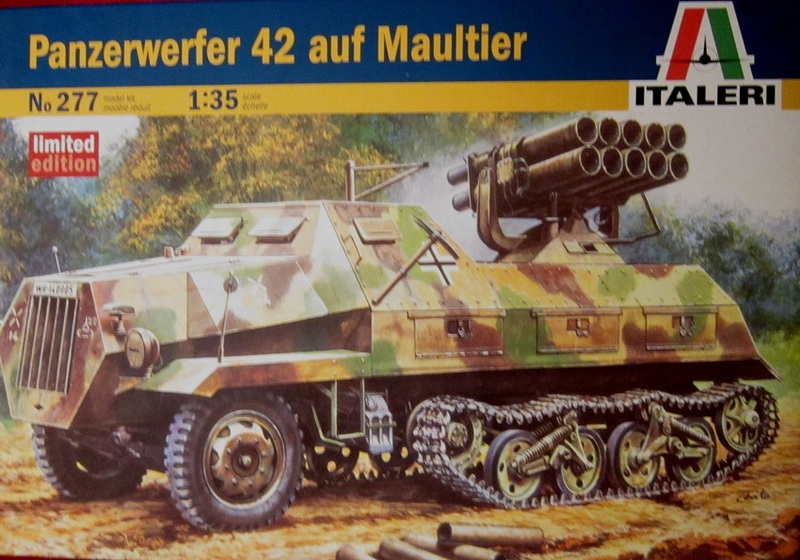 The box art shows a Panzerwerfer 42 Auf. Maultier parked in a woods. It is in a base of sand with dark green and red brown splotches as camouflage. It has narrow German crosses on the sides of the cab. On the nose is license no. WH-140905 above the radiator. A white X with number 14 below is on the left side of the radiator and a tactical sign in white with 22 beside it is on the right side of the radiator. The white X and 14 mark is on the sides of the hood. The rocket launcher is aimed to the side. Some empty rocket storage tubes ar spread on the ground. The other side panel begins with MADE IN ITALY and Italeri’s steet address in Italy. The copyright date of the kit is 2010. 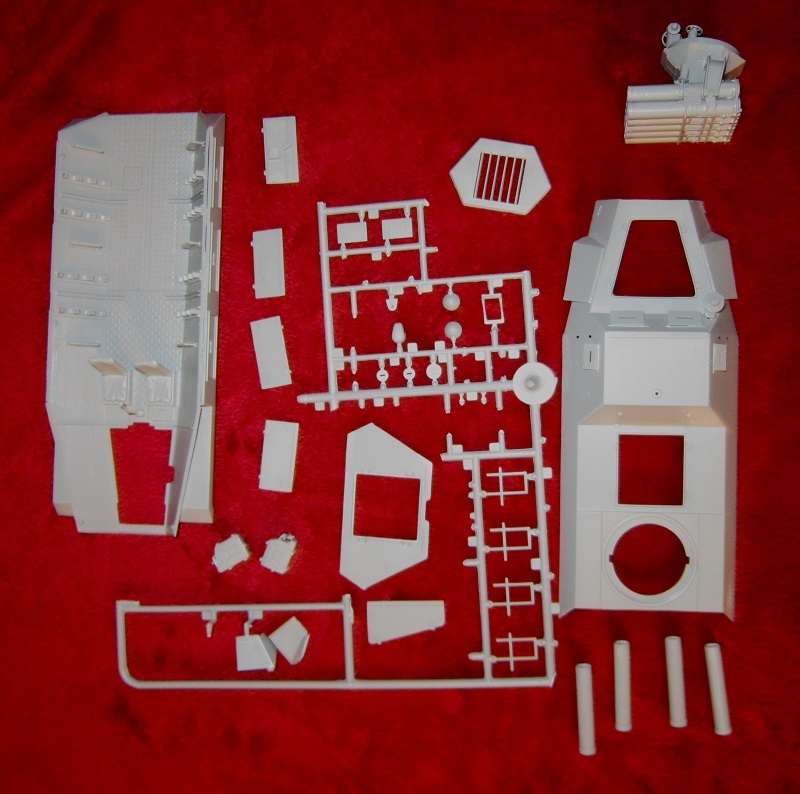 The kit is for modelers 14 years of age and older. Paint and cement are not included, followed by pictures of the decal sheet, black vinyl tires and rubber band type treads and the 2 parts trees that are in the kit. The parts trees are shown as being tan. However, they are actually grey in the kit. This kit contains 2 grey trees of parts, black vinyl tires and rubber band type treads, the decal sheet and the instructions. The constructions consist of a single sheet that accordion folds out into 8 pages in 8 ½” x 13” page format. Page 1 of the instructions begins with Italeri’s street address in Italy again, followed by the one paragraph histories again in English, Italian, German, French, Spanish and Dutch. The kit is again said to be for 14 year olds. Page 2 begins with “Attention-useful advice” about the kit in 6 languages, including English. Below this is the parts trees illustrations and a ist of Model Master brand paint color numbers with their Federal Standard number equevelant in some cases. Page 3 through the top of page 7 gives a grand total of 11 assembly steps. The bottom of page 7 has a 4-view of a Pz.Kpfw. 42 of a Self Propelled Rocket Launcher Unit, Russian Front 1944. It is the box art subject already described above. Page 8 has a second 4-view of a Self Propelled Rocket Launcher Unit, Western Front 1945. It is in overall sand. It has the license plate no. WH 1408826 on the left rear fender and above the radiator and a black tactical sign on the right rear fender. A narrow German cross is on the sides of the cab and the right of the rear doors. Below this is a coupon to use to order parts to replace any defective ones in the kit in multiple languages. Grey letter A parts tree holds: axles with springs attached, the frame, rocket launcher parts and ammo rounds, hull side panels, dash board, road wheels, return rollers, drive sprockets, ammo racks, front wheel hubs etc. (92 parts). One part on this tree is shown shaded out on the parts trees illustrations, meaning it is excess and not needed to complete the kit. The 2 black vinyl front tires and black vinyl rubber band type treads are next. The treads must be heat welded together to make a loop out of them and are not the newer glueable type.There is a screen on the tree that is excess to the model and it is not mentioned on the instruction sheet. 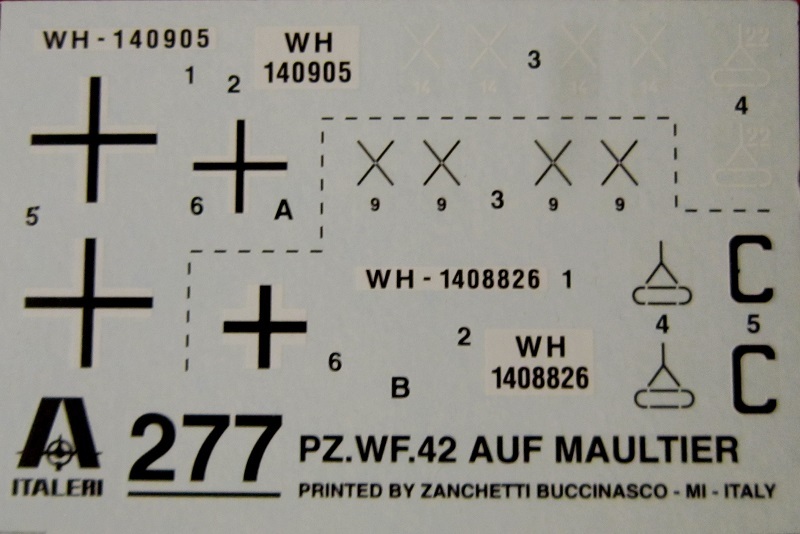 The decal sheet completes the kit’s contents. Included on it is a black let X with a number 9 below it and large black letter C’s. These are nowhere mentioned in the marking scheme instructions. I have started my kit and I have 2 of these kits in my stash. One of them I purchased years ago and the other was a gift years later. There are no clear parts in the kit nor crew figures.